The Planetary Dance is an annual all-day ritual of healing and community renewal. 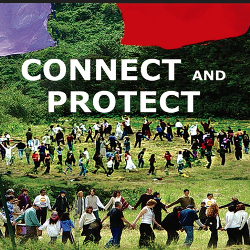 It is an invitation to people all over the world to join in a dance for peace in their own communities and for peace with the Earth. It brings people of all ages and abilities together in a beautiful setting to “dance for a purpose,” much as people in traditional cultures have danced for a bountiful harvest, a successful hunt, or a happy marriage. The Planetary Dance is a participatory dance rather than a theatrical performance. At its heart is the Earth Run, a simple dance that everybody can do. Participants are invited to run, walk, or simply stand in a series of concentric circles, creating a moving mandala. As we all move to the steady heartbeat of the drums, we become one collective body. Each step upon the Earth becomes a prayer for healing. During the second run, each person calls out a common cause, such as global warming concerns. (Example: “I run for clean water on all continents and for all people.”) The third and final run is led by the children dance with a dedication for the future. The children may invite adults to join them. The Planetary Dance is an event for all members of a family. Each Planetary Dance community around the world creates its own special focus, or theme, for this day-long event. Individual participants dedicate their dance to someone or some intention that connects them personally to this theme. The basic schedule of events involves a preparatory phase, the Earth Run, and a closure. In the Bay Area, for example, the day begins at sunrise on the peak of Mt. Tamalpais with prayers and songs. Around 11 a.m. everybody gathers at Santos Meadow, at the base of Mt. Tamalpais, for offerings of stories, songs, poems, and movement, as well as an introduction to the Earth Run. After the Earth Run, we eat together, reflect on the event, and talk about how we will carry the spirit of the Planetary Dance into the rest of our lives. In large group dances, something exceptional often occurs. When enough people move together with a common pulse and a common purpose, a profound force can take over. People stop moving as individuals and begin to move as if they were parts of a larger body, a group spirit. Cultures everywhere have evoked the power of this group spirit, enacting in dance what they hope to see take place in their lives-bringing rain, succeeding in the hunt, growing crops, initiating the young, and sending the dead to their resting place. It is a power that can renew, inspire, teach, and heal.